Now you can pay for your premium GoldFynch cases directly from the GoldFynch app. We have integrated a payment system using Stripe. All the payment processing is done through the Stripe service, which is kind of like having paying directly at the bank. 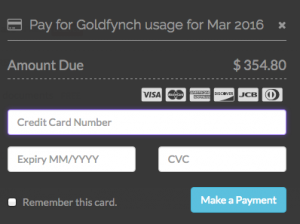 Since we don’t store any credit card information on GoldFynch, your payment information is secure. Read more about the security here. Billing information is per account and can be accessed at anytime from the top menu bar. Other than the free case, which is free, for the premium cases, the billing is calculated on a prorated basis. So you only pay for what you use. If you only have a case active on GoldFynch for 15 days and then you delete it, you only pay for 15 days. We actually calculate the billing rates per second! The prices advertised on the GoldFynch Pricing page are the monthly caps, meaning your monthly bill will never be more than the advertised amount. The billing for each account is itemized into cases, including cases that have been deleted. This feature is especially useful if you have to pass on the billing to your client. You can also download the PDF invoice for each case from the billing page.